Hi, I’m Danya, aka the Passive Gourmet. I love food, eating and sharing meals. So it makes sense that I like the cooking that brings all of this about. Wife to Tim, a marginally fussy husband, who is slowly adding to his ‘meat and three veg’ repertoire. Mum to Layne, a two year old who is inconsistent and surprising with her food. 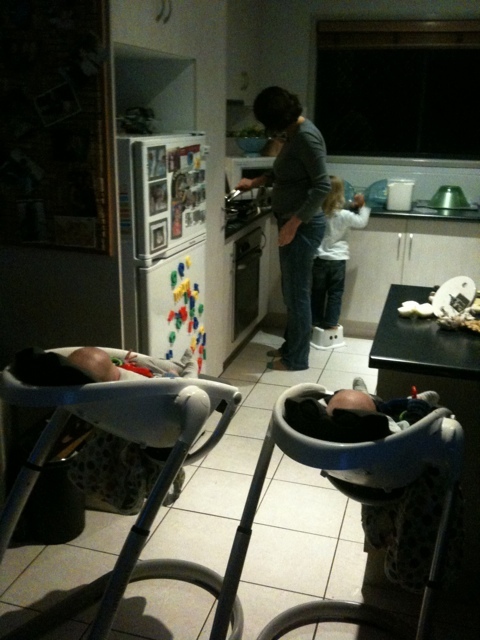 New Mum to Jake and Jordan, six month old twins who are just about to embark on their eating odyssey. nearly 10 years worth of Gourmet Traveller Magazines. a shoebox of recipes from the Internet, newspapapers and magazines. I realised that unless I actually cook from these things, rather than just reading them (I swear I don’t just look at the pictures), that they are just fiction. I also blog about keeping the fun in the Mum. 1 Response to Who is the Passive Gourmet?